Water is delivered from the Colorado River to the California’s Imperial Valley through the 80-mile long All-American Canal, which flows from the Imperial Dam near Yuma, Arizona east across the desert to just west of Calexico, paralleling the Mexican border for much of the way. 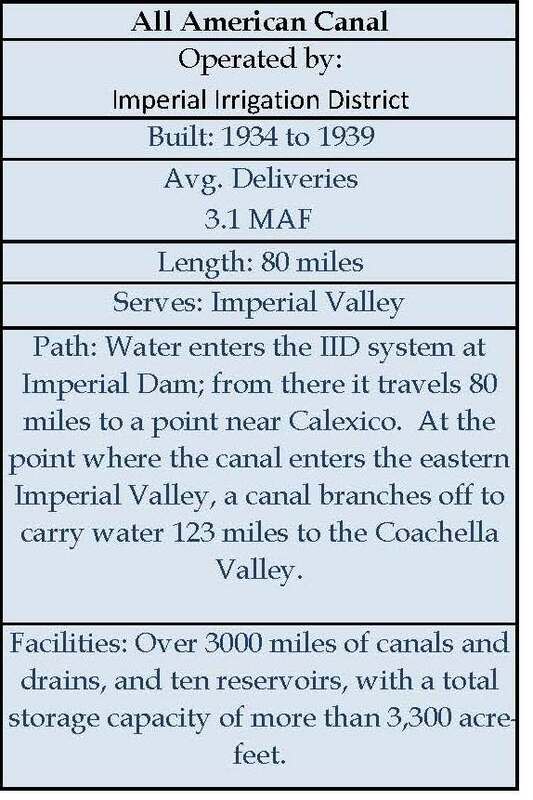 The Imperial Dam and the All-American Canal are operated by the Imperial Irrigation District, one of the largest irrigation districts in the nation, with over 3,000 miles of canals and drains delivering 3.1 million acre-feet of water to the half-million acres of productive farmland in Imperial Valley. IID’s distribution system includes ten reservoirs, with a total storage capacity of more than 3,300 acre-feet. Click here to visit the Imperial Irrigation District online. 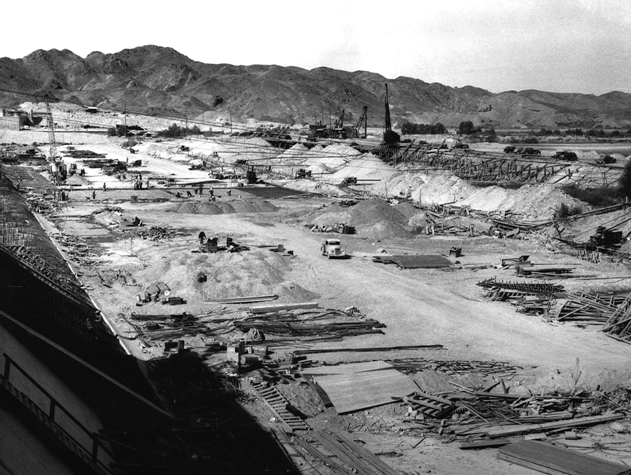 Construction began on the All-American Canal in 1934 and was completed in 1939, delivering water to the valley for the first time in the spring of 1940. However, it was not the first aqueduct to deliver water to the Imperial Valley; farming in the Imperial Valley began in the late 1800s with the California Development Corporation delivering water through the Alamo Canal. The Alamo Canal diverted water from the river at Pilot Knob, heading south into Mexico before turning back into the United States. Sharing a canal that crossed the border proved to be troublesome, and so a canal whose path stayed north of the border was authorized by Congress in 1928 as part of the act that authorized the construction of Hoover Dam. 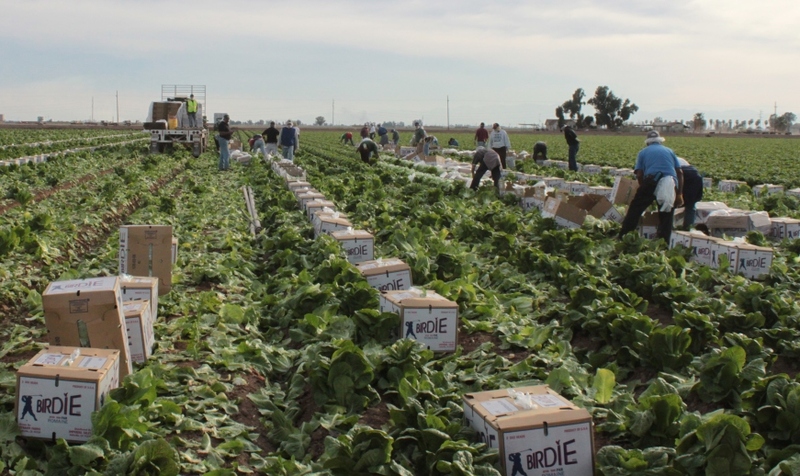 Imperial County is the tenth largest agricultural county in the nation, producing $1.2 billion in more than 100 different agricultural products, such as field crops, vegetables, melons, fruits, nuts, field crops, and livestock production. The Imperial Valley is also the state’s second largest producer of aquaculture, and is home to one of the largest catfish farms west of the Mississippi. Situated on a former floodplain of the Colorado River, the Imperial Valley has deep, rich soil, but here rainfall averages less than three inches per year. Winters are sunny and mild with highs in the 80s, while summer temperatures can soar over 120 degrees. The combination of fertile soils, warm climate, and the ability to apply water precisely to fit crop’s needs have made it one of the world’s most productive agricultural regions, with fields capable of producing multiple harvests per year. By the time the Colorado River reaches the Imperial Dam, it has a high level of dissolved salts; this salty water combined with the clay underlying the valley can result in the accumulation of salts in the root zones, resulting in smaller plants and reduced yields. 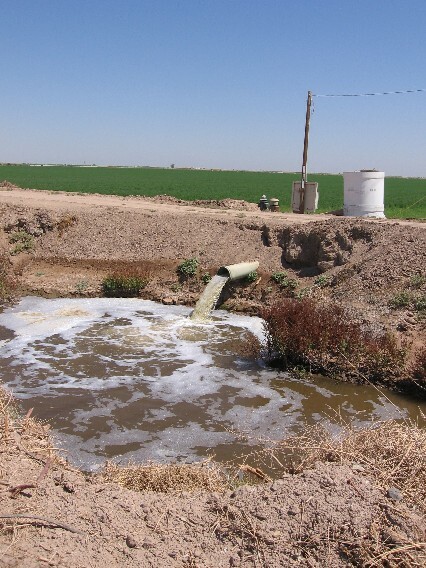 In order to combat this, almost all of the Imperial Valley’s fields are underlain by a drainage system of perforated pipes which drain the salts from the root zone. A 1,400-mile network of open drainage ditches carries the salty drainage water to the Salton Sea. Click here to visit the Imperial Valley Farm Bureau online. 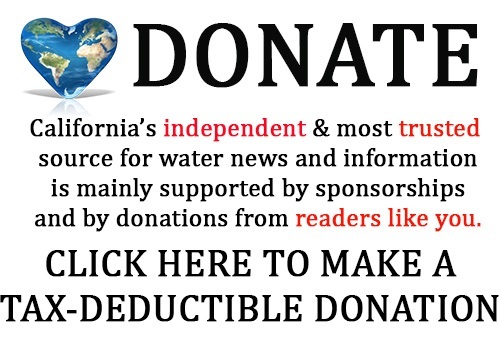 California had long since used more Colorado River water than it was entitled to, having been allowed to use surplus water from other states who held entitlements to water but hadn’t developed enough to fully use their allocation. However, in the 1990s as population grew throughout the southwest, the Department of Interior directed California to come up with a plan to live within its 4.4 million acre-feet allocation. In 2003, the Quantification Settlement Agreement (QSA) was negotiated, defining Colorado River rights for four Southern California water districts, as well as providing for water to be transferred to San Diego. It was the largest ever agricultural to urban water transfer; it was controversial then and remains so today. It has been challenged in court several times. The QSA is a complicated agreement resolving numerous issues regarding reasonable and beneficial use of Colorado River, the transfer of conserved water to San Diego, the quantification of water rights for four Southern California water districts, and obligations for environmental mitigation. The Salton Sea was of particular concern in the negotiations, since the conserved water to be sent to San Diego would come at the expense of the runoff that sustains the Sea. As part of the agreement, the Imperial Irrigation District and the San Diego County Water Authority agreed to send water to the sea, but that part of the agreement is set to expire in 2017, putting the sea’s future in doubt. As part of the QSA, the state committed to restoring the environmental health of the Salton Sea, adopting a plan for restoration in 2013; so far, the legislature has not funded the plan. 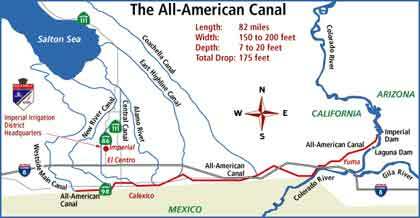 Click here for the Bureau of Reclamation page for the All-American Canal system.